I’m not entirely sure when I started my obsession with denim yarn, but what I do know, is that the first time I read about it, was on the ever entertaining Mason-Dixon Knitting blog. Knitting with cotton is quite a departure for somebody who is totally committed to wool, but knitting something with the intent of shrinking it took it immediately to a whole new level I had never entered before! The yarn I used is a denim yarn: it is rope-dyed with indigo (rope-dyed means it is dyed after the yarn is spun, just like the threads used for making denim fabric) and this means the yarn is not dyed through to the core. Over time it will fade, just like love-worn jeans. 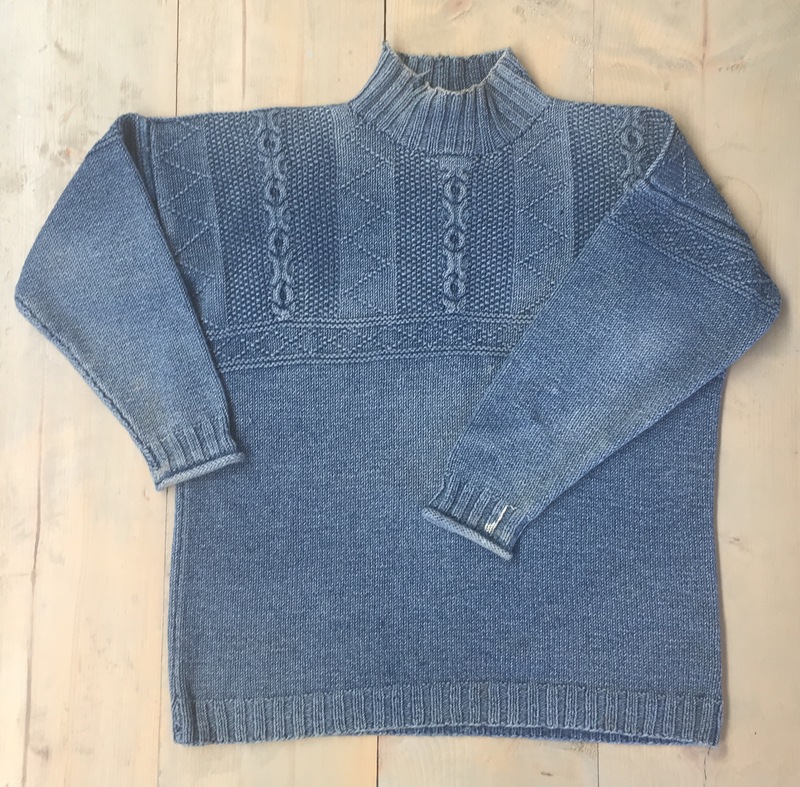 When I posted an knitting-in-progress picture on Instagram late last year, a student brought along her 20 year old denim sweater to a darning workshop. The colour fades over the years due to wash and wear, but only where it’s exposed. 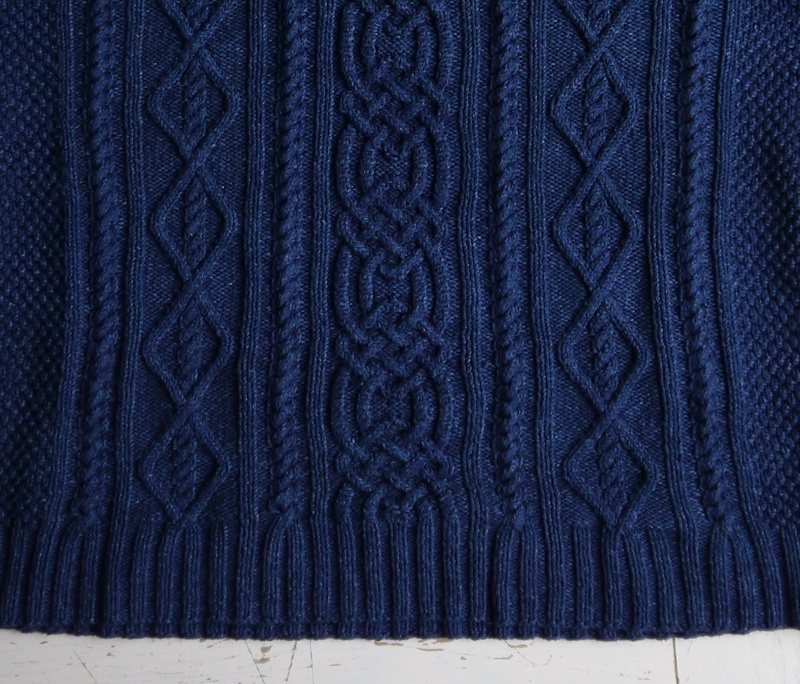 So in all the nooks and crannies of each stitch, the darker colour remains, and it makes the cables really pop. The effect is so beautiful, and this made me realise that my sweater is not just slow fashion, but Extreme Slow Fashion: in 20 years time, mine will look as beautiful as this one, and be incredibly soft. The other thing that makes for such a beautiful knit, is the super-tight gauge for the yarn weight. 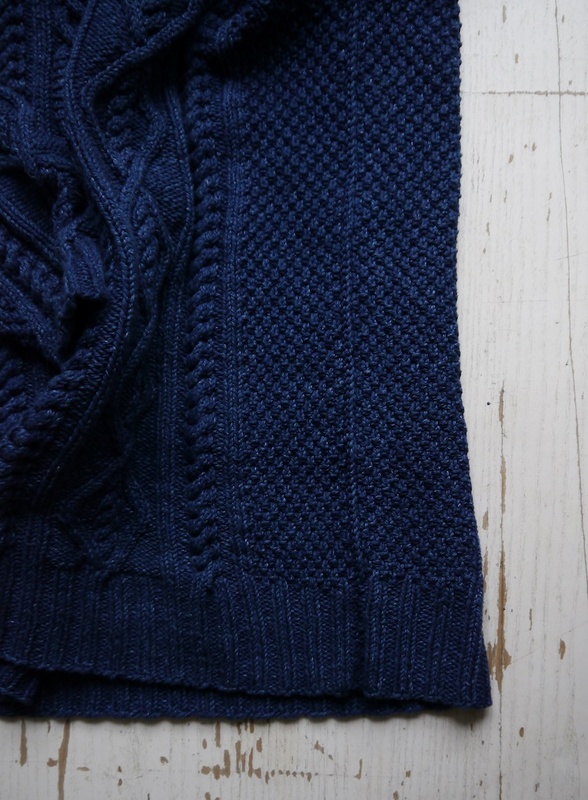 Unlike my Cornish Knit-frock, which was wrested from 5-ply Guernsey yarn on fine needles, the denim yarn knit gets its tight gauge from something else altogether: a boil wash. Yes, you throw your jumper fresh from the needles into a hot wash and wait for it to shrink! Denim yarn patterns take this shrinkage into account, and nobody has written better patterns for denim yarn than Jane Gottelier, who founded the Artwork knitwear label in 1977, together with her husband Patrick. 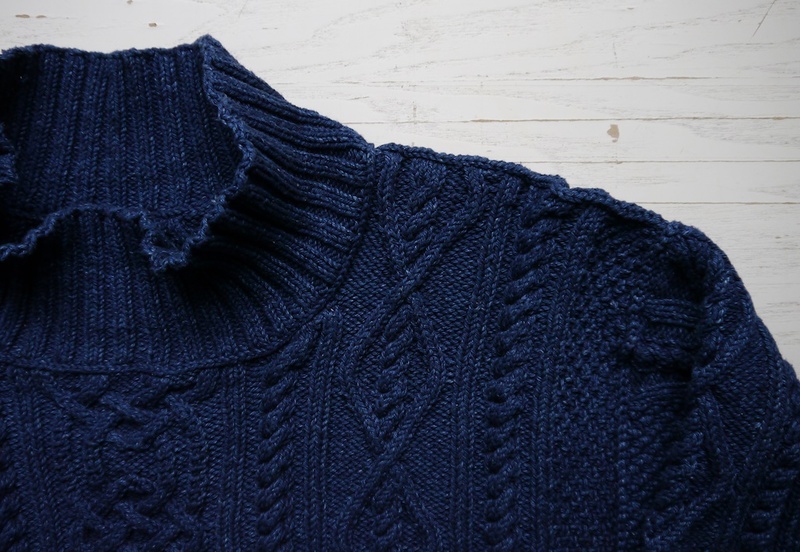 In 2007 they released a knitting pattern book called “Indigo Knits” and it’s this book the Whitby Sweater pattern comes from. The book is full of hints and tips on how to get the best out of your denim yarn, from that all-important first wash, to fake fading with bleach. It’s a good thing I’m a very patient person, as I don’t like pre-distressed clothes. It never looks quite right in my eyes. Nothing beats authentic ageing, particularly when it comes to denim. So no bleach to highlight cables for me, just years of wash and wear ahead of me. Most denim yarn knitting patterns advise you to knit a garment in pieces, and throw them in a hot wash, together with some extra yarn, so that everything shrinks before you sew it up with the shrunk extra yarn. However, I found out through Kay from Mason-Dixon Knitting that Artwork tended to sew up their garments before the hot wash. So if it’s good enough for a luxury fashion label, it is good enough for me! 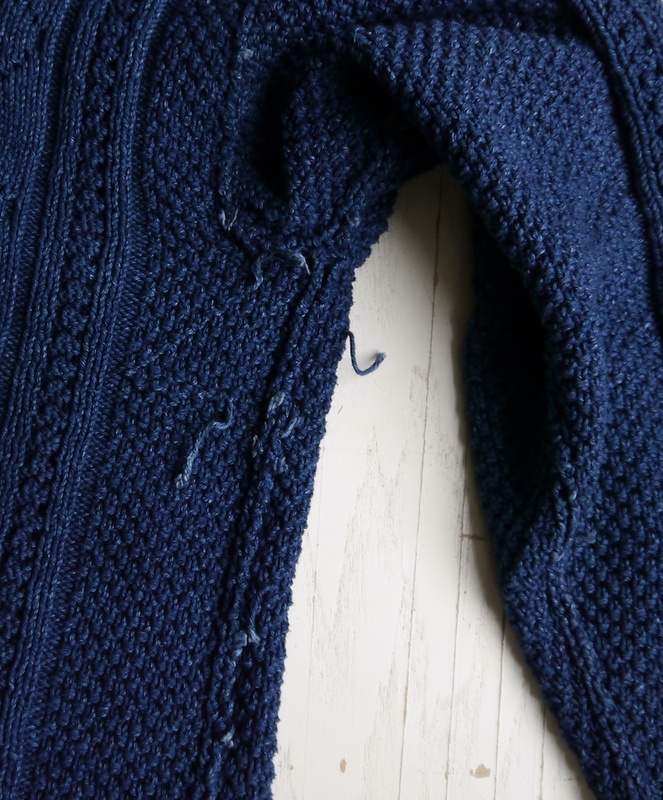 I’ve grown really fond of the exposed three-needle bind-off as a way of seaming sweaters, so I used this method on all the seams here, too. Another finishing touch I really like, is the transition of the main fabric to the collar, by way of some crochet. I bind off all sweater pieces, seam the shoulders, and I then crochet a chain all around the neckline. 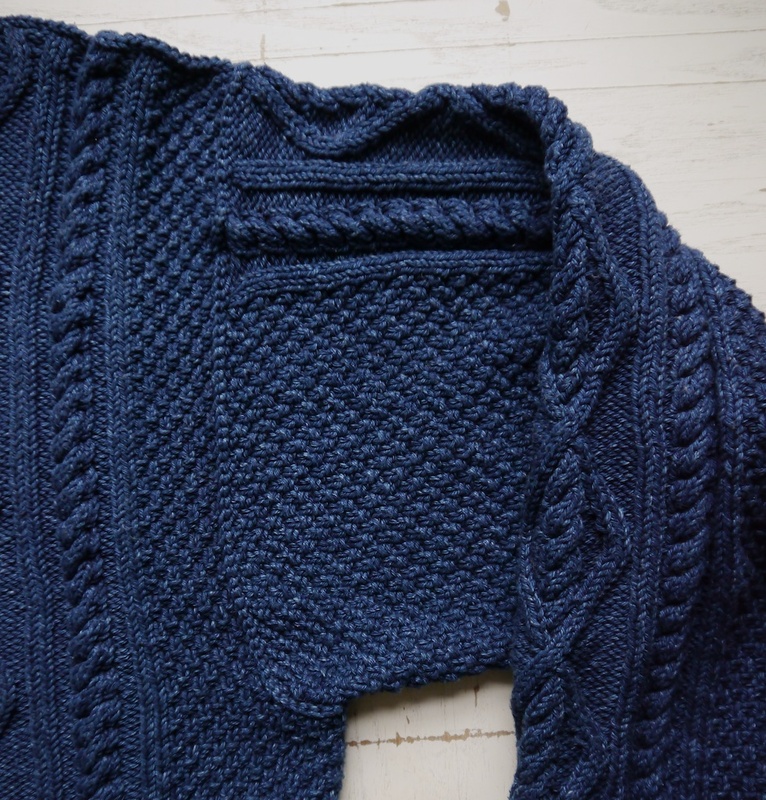 I like this because it makes for a stable opening that doesn’t stretch out of shape; something that is particularly important for this heavy cotton cable knit. I then pick up a stitch through each chain to knit the collar. 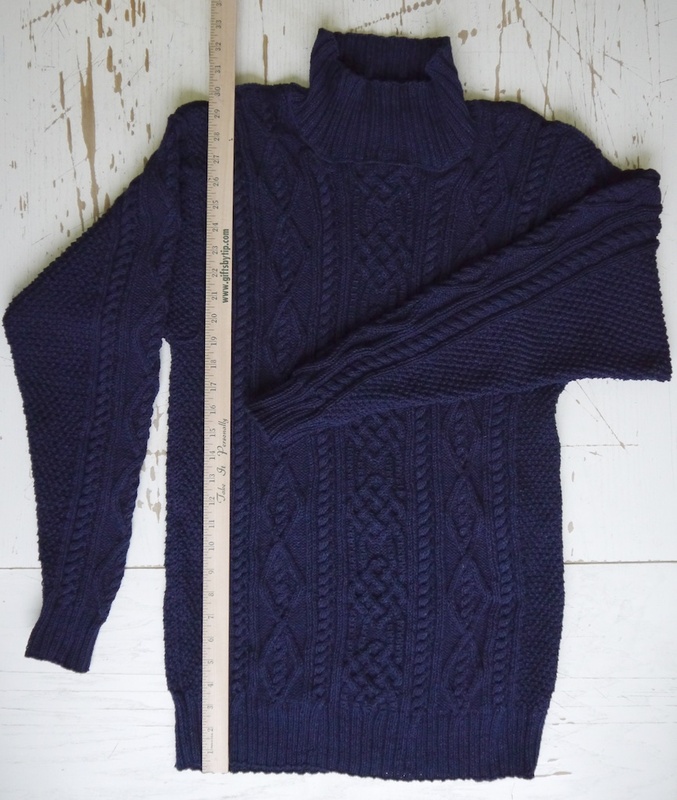 I used another little trick here: the first few rows were knitted on the same needle size as elsewhere for the ribbing, but after five rows I used a needle one size smaller, and after another five rows, I went down yet another needle size to complete the funnel neck. One thing I was a bit nervous about, was sewing in ends. Although this denim yarn isn’t as slippery as a mercerised cotton, I did notice that during knitting it, knots from knotting together the end of one ball to the beginning of the next, easily came undone. So I left very long tails, and all wove them in in the same direction in the seams, so that they would be able to shrink, without puckering up the seams. I really enjoyed knitting this sweater. 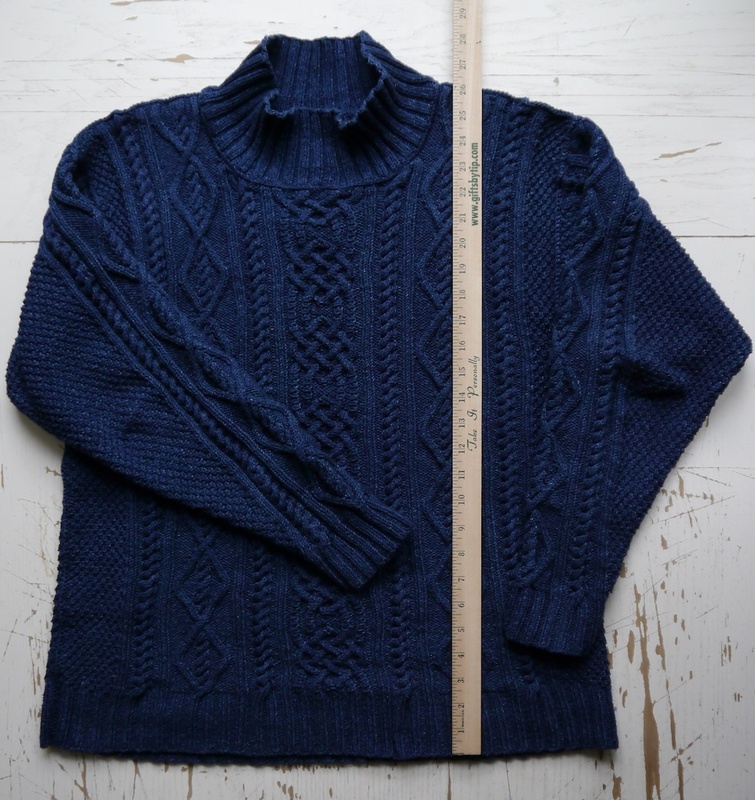 It was a slow knit, but compared to how long I’m planning to wear it, it was done in a flash, and I’m dreaming about designing my own sweater in denim yarn. So I’ll share the only picture I have so far of me wearing it. 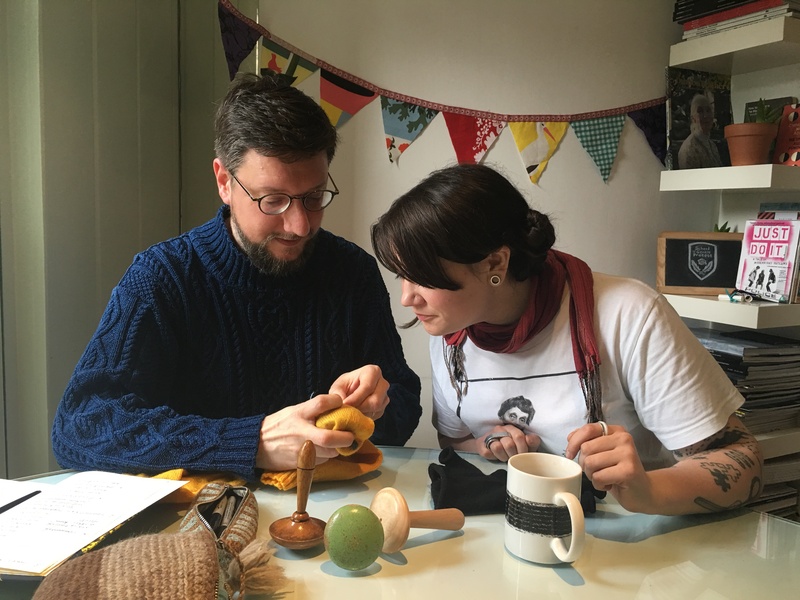 You can see me in conversation with Sarah Corbett, founder of the Craftivist Collective. We had a really lovely afternoon together, and I can’t wait to share with you what we have been up to, so keep an eye for a new blog post soon!